This article is about only the executive branch, headed by the Prime Minister. For all branches, see Politics of Russia. According to the 1991 amendment to the 1978 Russian Constitution, the President of Russia was the head of the executive branch and headed the Council of Ministers of Russia. According to the current 1993 Constitution of Russia, the President is not a part of the Government of Russia, which exercises executive power. But, the President does appoint the Prime Minister. The Chapter 6 of the Constitution of Russia says, that "The Government of the Russian Federation consists of the Chairman of the Government of the Russian Federation (Prime Minister), Deputy Chairman of the Government of the Russian Federation and federal ministries". After the fall of the Soviet Union, the Russian Council of Ministers had become the main executive body. At some points it contained over 69 state committees, 16–17 ministers, 5 federal services, and over 46 governmental agencies. After the 2004 reform, government duties were split between 17 ministries, 5 federal services, and over 30 governmental agencies. The Russian Federation practices asymmetrical federalism. This means that not all regions are treated equally and that some regions have been given more autonomy than others. There are 7 super regions (federal districts) with a super governor that answers to the President. Those super regions include the South, Central, North-West, Far East, Siberia, Ural, Volga, and North Caucasus. They were established in May 2000. The prime minister, currently Dmitry Medvedev, is appointed by the president (currently Vladimir Putin), and confirmed by the State Duma. He or she succeeds to the presidency if the current president dies, is incapacitated, or resigns. Corruption is common and widespread in the government. According to 2016 results of Corruption Perception Index of Transparency International, Russia ranked 131st place out of 176 countries with score 29. Multiple anti biggest stances taken against corruption is the formation of the Anti-Corruption Council in 2008. The large body was preceded by Government of the Soviet Union. Since the Russian Federation emerged in 1991 to 1992, the government's structure has undergone several major changes. In the initial years, a large number of government bodies, primarily the different ministries, underwent massive reorganization as the old Soviet governing networks were adapted to the new state. Many reshuffles and renamings occurred. On 28 November 1991, President of the RSFSR Boris Yeltsin signed presidential decree No.242 "On reorganization of the government bodies of the RSFSR". Yeltsin officially declared the end of the Soviet Union and became the President of the Russian Federation. Yeltsin was a reformer and promised Western-styled democracy. In 1993 the new Russian Constitution was adopted. The new Constitution gained legitimacy through its bicameral legislature, independent judiciary, the position of the president and the prime minister, and democratic features. These democratic features included competitive multi-party elections, separation of powers, federalism, and protection of civil liberties. In 1999, Yeltsin appointed Vladimir Putin as the Prime Minister. Later in that year, Yeltsin resigned from the presidency and Putin took over. In 2000 Putin won the presidential election. 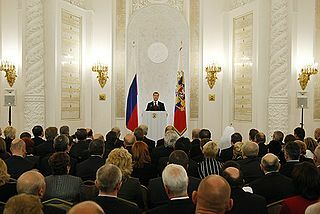 The most recent change took place on 21 May 2012, when President Vladimir Putin signed a presidential decree on forming Dmitry Medvedev's Cabinet. exercise any other powers vested in it by the Constitution of the Russian Federation, federal laws and presidential decrees. The government issues its acts in the way of decisions (Постановления) and orders (Распоряжения). These must not contradict the constitution, federal constitutional laws, federal laws, and Presidential decrees, and are signed by the Prime Minister. The Government, also assists the Prime Minister, in faithfully carrying out the country's domestic and foreign policy as determined by the President, in general. ^ "Премьер представит президенту структуру правительства 15 мая" [Prime Minister will present the government structure to the President on May 15]. Vesti. May 11, 2012. Retrieved September 22, 2017. ^ "New Cabinet Has Familiar Cast of Characters". The Moscow Times. May 21, 2012. Retrieved September 22, 2017. Dmitry Anatolyevich Medvedev is a Russian politician who has served as the Prime Minister of Russia since 2012. From 2008 to 2012, Medvedev served as the third President of Russia.